Its been about 6 hours since I found out that my embryo didn’t grow. I am at a crossroads. Some people are already telling me to try again, and the truth is I just don’t know if I have it in me. I still can’t believe I have to continue meds and check again in a WEEK to verify that it’s not growing.I asked how often embryos recover from this, but no one answered my question. It means I will be carrying a dead embryo for a week. The idea makes me sick, but it seems that by law they can’t give up now, they have to wait for 8 weeks. I did everything I could, and I know that my Dr and Molly did as well. Maybe its time to give up, and acknowledge that I just don’t deserve to be a parent. I promised myself that if I ever got pregnant, I wouldn’t complain about the PIO shots or the symptoms or anything really. I haven’t. I promised that I would only care about the health of the embryo and that I would enjoy and embrace the changes I have spent the last weeks adjusting to. I kept my promise. I haven’t complained about anything. Not morning sickness, not the shots, not doing it by myself, not anything. I haven’t felt like I have the right to. If it meant getting a chance at a healthy baby then I would endure whatever I had to. After the appointment my husband went back to work. I’ve spent the last 6 hours alone in a dark room trying to understand. Tonight I took my meds, gave myself the shot, my husband never administered a single one, was never in the room with me and never helped me with them. Mostly I think he just didn’t want to think about them. Like every night, he wasn’t here when I did it, and when he got home, he took my stepdaughter out for dinner. I don’t know whats going to happen to this blog. I don’t know where I am supposed to go from here. I intend to mourn my loss privately, I do not need to feed the misery so many of you feel, and are still going through. So for now, I’m signing off. Good luck to all of you. For those of you that have my email address please feel free to contact me, but for now, I can’t continue to publicly write down my feelings. Right now they are overwhelming and almost too much for me to handle. Generally the second beta is given 48 hours after the first one. But since the first beta was last Friday, and the clinic I go to is closed on Sundays, I was asked to come back 4 days after my first beta. Which was this morning; 181.5. I was told not to worry about it, but coming in 98.5 points lower than the Dr wanted to see? Yeah that’s concerning to me. Since my positive pregnancy test, Ive come to realize something. It doesn’t all end with a positive and then fade to whatever baby color that represents the gender and you go on happily ever after. There is a critical path, milestones to be met, a third beta, the first ultrasound, the heartbeat, because of my age a battery of tests that will come in November and December should I make it that long. Somewhere around the 16th week I can start to feel safe. Maybe. Which for me, means it will be 2013, before I can stop worrying. 16 weeks seems a long way away. Which led me to thinking about children. In IVF, you worry throughout the process, you are anxious about your levels, you bodies response, your results, your ability to make follicles/eggs, their quality, if there are male factor infertility issues, you worry about Everything. You change your diet, you take supplements that make you to produce the most expensive urine in the world. You worry about the cost, the toll it takes on your relationship, the toll it takes on you as a person. Where does it lead? It leads to the elusive (you will worry about that too) positive test, and a whole new slew of worries and anxiety. Assuming the outcome is a live birth, you will then worry about that child for the rest of your life. I guess the upside of all the disappointments and anxieties that go with IVF and infertility, is that it prepares you better than most for parenthood. What does it mean? I means I’m going to walk through my worries and anxieties 1 step at a time. I’m going to try to not to predict the future, because it isn’t written yet, and I’m going to do everything I can to get enough rest, keep stress at bay, eat well, and have faith. From here on out, I am stepping into the unknown. I will be grateful for every day I have with this miracle. I went to my clinic to get a final blood draw, and ultrasound this morning to see what my levels are and what my Endometrium (lining) is. Dr Yelian did it himself. Results: Endometrium 12.4, E2 185+, P4 26.87. My PIO dose has been increased to 1.5ccs. Ow! The transfer is tomorrow at 2:15pm. I will need to be there 30 minutes early, and I will be having acupuncture both before and after the transfer. I stopped by the Temple today to light candles, meditate, pray, I asked a monk for a blessing, I asked for strength and grace, for this blessing to become a reality, and for happiness good health and harmony for my family. I also asked for forgiveness because I’m a tremendously flawed person. But I am becoming someone I like. Then I went and got my hair done, because you know what? I don’t want to spend the next few weeks looking at my dark roots. I’m such a girl (I don’t know where this vanity comes from, I’m not even a big makeup wearing person). On the way home, I stopped Costco and bought a big fragrant pineapple, some milk, and some nuts. You know what I didn’t do today? I didn’t hide me knickers at the ultrasound. In fact I took a picture to prove it. 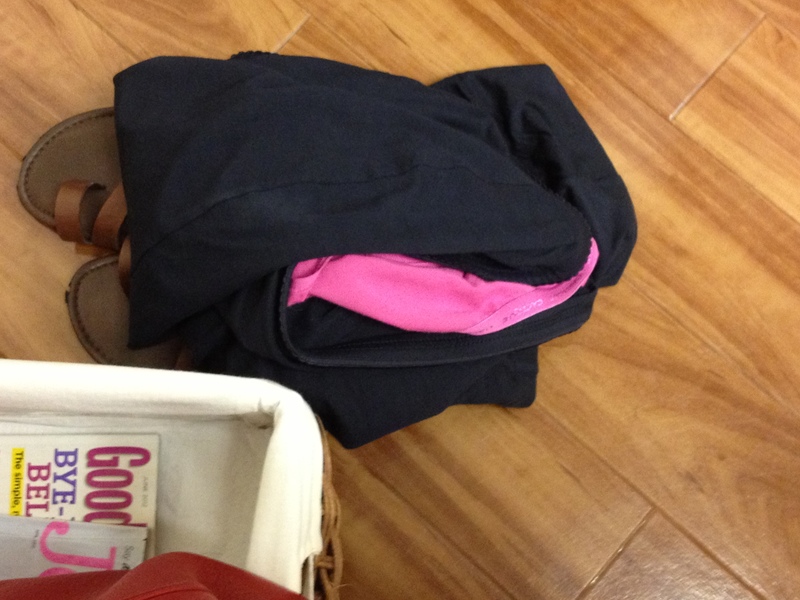 I even wore hot pink ones just to give my otherwise boring underpants choices a pop of color. I’m starting a knicker revolution. Not really but my blue skirt and hot pink underwear made me laugh and Dr. came into the room before I could shove them out-of-the-way. So here you are. My knickers. It’s not the full shot but its them all the same. Also notice I was not tidy and didn’t fold anything. Its been about 100 degrees lately so knit skirt, t-shirt sandals, I’m golden. Meditations tonight, some happy thoughts, my first butternut squash soup of the season. A nice peaceful, quiet, evening. Thank you to everyone that responded to my earlier post, What ever happens is out of my hands now. But I will be praying my little Jinyu snuggles in tight. Lastly, I’m going to post my IVF song. Don’t look at the video just listen to the music and lyrics. It’s by Ian Britt, an incredible artist and a friend. It’s what I’d say to my imaginary baby. (Shameless plug) You can buy Ian Britts amazing work on iTunes. Wish me luck. Thank you so much! In less than 2 hours I have my last check to see if things are a go for tomorrows transfer. I admit it, I’m nervous. Part of me want to move forward immediately and the other part of my want to yell slow down! Its my last frozen blast, I’m scared! I ordered a rather expensive fertility bracelet 6 or 7 months ago, and I’ve worn it every single day, without fail no matter where I go for that entire time. I take it off only at night and at acupuncture. Last night after my class, I was taking it off and it broke. I froze for a second. Thinking is this a bad omen? Then I thought I don’t believe in omens, so I thought, maybe the universe is trying to tell me something? Then I thought, well that’s stupid. Always a fight between the rational and irrational me. A bracelet isn’t going to make this transfer fail. An embryo with chromosomal abnormalities will. Chromosomal abnormalities that make it not compatible with life, that’s what will make this fail. Maybe my hormone levels will cancel the transfer, or my Endometrium will not be ideal. I am ready for that to happen if that’s the case. After my egg retrieval last Friday, my Dr prescribed Progesterone in Oil shots, progesterone pills and Estrace that started the same day as the retrieval. Last night because I had class from 7-10pm, I had to give myself a PIO shot with no mirror, in a public bathroom. Seriously? Because the first night I hit a vein or something and caused a bruise that’s eggplant purple and about 4×6 my right side is out. The left side by last night had 4 little hard grape sized bruises so I just went for it, between them. It of course bled a bit but, I’m doing the best I can considering husband refuses to do it and I had to do it in a public bathroom like some kind of fertility medication junky. There is absolutely no dignity in this process. I don’t know if you guys remember my little “Luteal Phase Follicle” miracle, but this is it. This is the one that was retrieved post ovulation, fertilized normally, I was called on Day 4 that it died, and then it became a 6AA hatching blast. There is a series of posts written about it that I believe started with this one;l Circus School: Luteal Phase Follicle Edition. There are a few more posts about it after, following me though the wait to see if it would fertilize and then live to day 5. This is the embryo that would be transferred back. Which I think is part of what makes me nervous, I’m a little afraid to let go of this embryo, a little afraid that it’s already had its magical moment and wont become a baby. Thank you to everyone who gave me their opinions about this decision. Having been down this particular path before and failed, I’ve not been as much in a hurry as the rest of you, but I do have 3 additional retrievals and I guess that’s a good enough backup. As you can see, I never made a decision I’m going to let the numbers and the professionals decide for me. It’s rarely been out of my mind since it was suggested to me 4 days ago. I’ve thought about it, meditated on it, and am giving it up to God or Buddha or the Creator, Science or whomever. Consequently has anyone looked at the moon the last few days? September 30 was the Harvest Moon, and the Chinese Moon Festival, the time of the year when its closest to earth, its been beautiful and huge! I will update once I find out which way the tide will be turning. After yesterdays less than stellar egg retrieval, and a meeting with Husband and Dr Yelian, he said to us “There is good news and bad news about this retrieval. The bad news is that we didn’t get an egg. The good news is that your lining is perfect for a transfer. Since no egg was retrieved yesterday, I will monitor again on Tuesday before transferring on Wednesday, assuming I go through with it. I left the office with progesterone in oil, syringes for the injections, progesterone capsules and another prescription for Estrace. Its kind of a terrible decision to have to make. Its one that I’ve flipped flopped about at least 4 times in the last 24 hours. Normally I am extremely decisive, so this is new for me. My impatience would be at least temporarily satisfied. I could be pregnant by the end of the year. Last night this is what I really wanted. According to the Dr this is looking very good for a transfer. In the cold light of day and a return to logic, I have 3 retrieval left, this is my last frozen blastocyst and honestly I’d feel better with a backup. The last couple of cycles have been really disappointing. I am not sure there is enough distance between the stress and anxiety of the last 2 months and my previous failure. I spoke with Dr Yelian today and he said that 1. everything look good, but that he wants to test my levels to see how things are the day before the transfer. If anything is even a little off the cycle would be cancelled. So why is this such a hard decision for me to make? Why am I struggling so much with this one? He asked that I start with the meds last night so I did. But I’m not 100% committed to this transfer and I told him as much, I am still thinking about it. You guys have heard almost every detail since March 1, when I started this blog, so I’d like your opinions. Assuming you were me, and were facing this decision, what would you do? Please do not pussyfoot around my feelings. I prefer honesty and I hope that you guys will be kind enough to give it to me. What would you do? Throw caution to the wind and try, possibly fail again, or give it some more time, do more retrievals and still potentially fail?